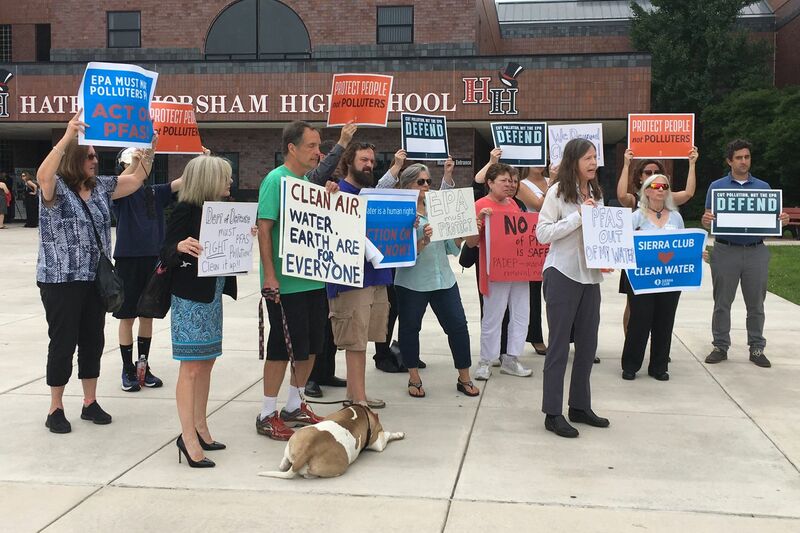 Protesters held signs outside Hatboro Horsham High school, where EPA officials met with local residents and officials to discuss water contamination. Residents and local officials had one major message for the Environmental Protection Agency at a Montgomery County meeting Wednesday: Do more to help communities like theirs that are dealing with tainted water and to develop regulations for the chemicals that polluted their towns — and don't make them pay for it. Hundreds of residents and officials attended the daylong meeting convened by the EPA in Horsham, part of a summer tour to visit communities affected by water contamination from chemicals known as PFAS used on military bases. It is the first such coordinated outreach in local communities since the contamination was discovered four years ago. Throughout the morning, a Washington-based contingent representing the EPA, the Department of Defense, and other agencies laid out its findings and plans to address the contamination. Then the group heard from state, local government, and community panels before beginning a public comment session scheduled to last until 9 p.m. The discourse was largely civil — but many residents made heated pleas to the EPA, and a handful held protest signs outside the event in the Hatboro-Horsham High School auditorium during a break. Dozens inside took advantage of the opportunity to question, challenge, or implore the federal officials to say and do more. "It would be easier to believe if you would follow through and do anything," said Lauren Woehr, a mother from Horsham who worried about her 16-month-old daughter's health and, like many residents, wants the agency to arrange testing. "If you want us to start believing you, then prove it by providing the testing." Lisa Daniels, one of the many state environmental officials on hand, said the cleanup and remediation demanded federal coordination. "I'm here to say states cannot do this work alone. We're just not capable of doing this on our own," said Daniels, of the Pennsylvania Department of Environmental Protection. "People will continue to question the safety of their water if we don't do this at the national level." Firefighting foams used for years on former military bases in the area tainted the drinking water of at least 70,000 residents in Horsham, Warminster, and Warrington Townships, and similar reviews are underway near hundreds of current and former military sites nationwide. Wednesday's meeting came weeks after the release of a government analysis suggesting that PFAS are potentially more hazardous to humans than the EPA had previously indicated. Four years after the water contamination was discovered, scores of residents are paying higher water bills due to the costs of making the water supply safe, and dozens report cancers and other illnesses. Some residents with tainted private wells are still drinking bottled water supplied by the military, waiting for hookups to public water. People are also, and more commonly, exposed to the chemicals through consumer products. The PFAS class of chemicals is complex, largely unstudied, and vast — containing between 3,500 and 4,500 chemicals, officials said — which makes the cleanup tasks even more challenging. The EPA detailed its goals for addressing various issues caused by the contamination, including a lack of knowledge about the PFAS chemical class, toxicity and human health, drinking-water treatment technology, cleanup of contaminated sites, disposal of contaminated materials, and understanding how people become exposed. Officials also said they are developing ways to assist states and communities dealing with contamination, including a "PFAS management plan" that the EPA committed to at a national summit in May. The agency is considering listing PFAS as hazardous substances and creating enforceable guidelines. "We're trying to develop data and tools people… can use to make actual decisions about managing risk," said Andy Gillespie, an associate director in the EPA Office of Research and Development. The Agency for Toxic Substances and Disease Registry (ATSDR) will soon launch a Pentagon-funded study to examine exposure in eight communities near current or former military bases. Military officials were also authorized by Congress this week to begin an assessment of health effects on veterans, said Maureen Sullivan, an assistant director at the Department of Defense. In local communities, officials have ignored the EPA's advisory level of 70 parts per trillion for drinking water and aimed to get their drinking water as close to zero as possible. Speakers Wednesday asked the EPA to set a stricter drinking-water standard for the chemicals — one that is legally enforceable. "We are very confident in the value we have that supports the 70 ppt," said Peter Grevatt, director of EPA's Office of Ground Water and Drinking Water. "And, that said, we're going to continue to work very closely with ATSDR and others to make sure we've got the best science underlying what we have." Still, many of the attendees expressed frustration over the pace of the federal response. One after another, health and environment officials from mid-Atlantic states called on the agency to spearhead a uniform national response. On one panel discussion, local officials said federal agencies needed to pay for the cleanup, much of which is currently shouldered by residents and localities. "Our customers, our residents, our family has not caused contamination of the water supply, and they certainly shouldn't be responsible for the cleanup costs," said Tim Hagey, general manager of Warminster Township's public water system. The meeting was part of a series scheduled by the EPA across the country — the first was in New Hampshire in June, and officials will go to Colorado in August before visiting North Carolina and other states. They say they will release their management plan in the fall — one that some attendees hope will help turn the corner on the issue. "Every community across the country needs a consistent and coordinated action plan," said Joanne Stanton, a lifelong area resident and member of the National PFAS Coalition. "We ask you to act now and please make public health your number-one priority."